Attractive and durable, yet lightweight enough for easy maneuverability, the cushioned Grand Isle motion club chair is designed for outdoor use. Packaged here as a handy set of two, the chairs help turn patios and porches into fun outdoor retreats. 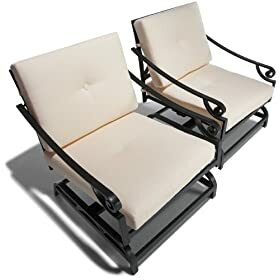 Designed with an easy, relaxing rocking mechanism, the frames are crafted of black powder-coated aluminum. Ideal for use in outdoor furniture, cast aluminum is heavier and sturdier than standard aluminum but much lighter than cast iron. It's also quite resistant to chipping, fading, and rusting. The slat design on the seat allows for maximum ventilation and the concentric square design on the back provides good support and makes for a stylish, good-looking view of the chair from behind. Each club chair measures 32.5 inches high by 35.2 inches deep by 28.3 inches wide, weighs 29 pounds, and comes fully assembled. Pair the set with matching Grand Isle pieces, or rely on their versatile good looks to go with virtually any outdoor collection. Adding comfort to the sturdy design are removable seat cushions which are secured to the frames via straps. The cushions are upholstered in 100 percent Olefin canvas and filled with 50 percent polyester and 50 percent PU foam. Seat cushions measure 25.6 by 30.3 by 4 inches, and back cushions measure 20.5 by 25.6 by 4 inches.